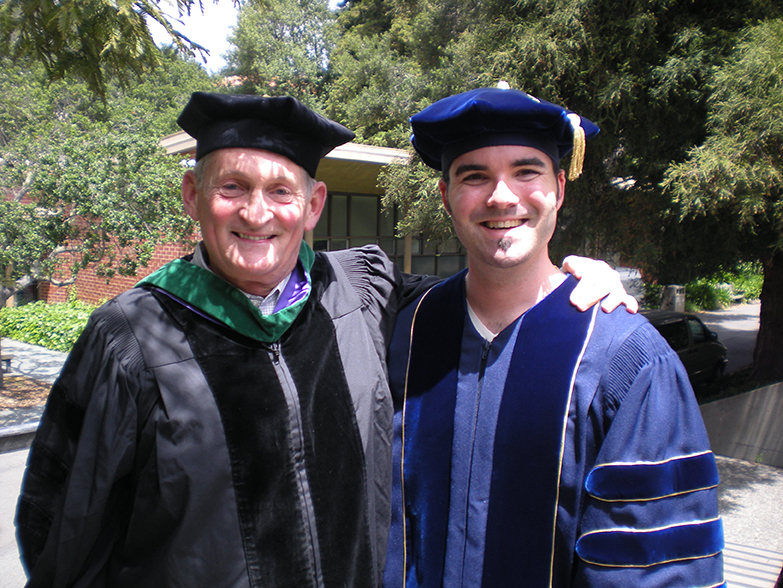 Bradley Voytek and PhD advisor Bob Knight. Bradley Voytek joined the Berkeley Neuroscience PhD Program in 2004 and completed his thesis work in Bob Knight’s lab, studying the relative contributions of prefrontal cortex and basal ganglia networks to working memory in humans, and the compensation that occurs following a unilateral lesion. Following his PhD studies, he worked as a data scientist at Uber and was a postdoctoral researcher in Adam Gazzaley’s lab at UC San Francisco before getting a faculty position in 2014. Voytek is currently Assistant Professor of Cognitive Science and Director of the Cognitive and Neural Dynamics Laboratory at UC San Diego. The Voytek lab studies rhythmic synchronized brain activity, called neural oscillations, and their role in information processing in the healthy, aging, and diseased brain. Voytek is also an avid science communicator. As a PhD student he joined the undergraduate Cognitive Science Student Association, which he credits with his initiation into science communication and outreach. He writes a popular blog about neuroscience and has over 11,900 twitter followers. He has written articles for The New York Times and Wired among other widely read publications, and a book, “Do Zombies Dream of Undead Sheep,” that introduces its readers to the ideas of cognitive science by asking questions about the zombie brain. In my discussion with Voytek, it became clear that he is a man who knows what his priorities are: he cares about practicing science, communicating science, and spending time with his family. He is humble enough to admit that science is challenging, but he loves science enough to put in the hard work it takes to keep moving forward. The following Q&A has been edited for brevity. What got you interested in neuroscience? Initially I was interested in physics but I was a terrible undergrad at physics. Around that time, my grandfather was diagnosed with Parkinson’s, and his cognitive decline was very rapid. That prompted me to think about the brain. How does somebody go from being a competent, smart engineer, to…not, so quickly. At the time I was really interested in astrophysics and cosmology. Like where do we come from, and how did we get here, kind of stuff. And it occurred to me that none of that really matters unless we know what we are and who we are. What was your experience like in the Berkeley Neuroscience PhD program? It had its ups and downs, like grad school in general. Mostly ups, thankfully. I started in 2004 and worked with Bob Knight. He was my PhD advisor, and he was also the director of [the Helen Wills Neuroscience Institute] at the time. [The Neuroscience PhD Program] was just starting, so we had a lot of input. Kati Markowitz was the head admin of Helen Wills at the time and she was amazing. We spent a lot of time with Kati, talking about the program and the future of the program with her and the faculty. The research was exciting. That was when Bob Knight first started getting into these intracranial electrocorticography recordings in humans. The experience was overall just phenomenal. 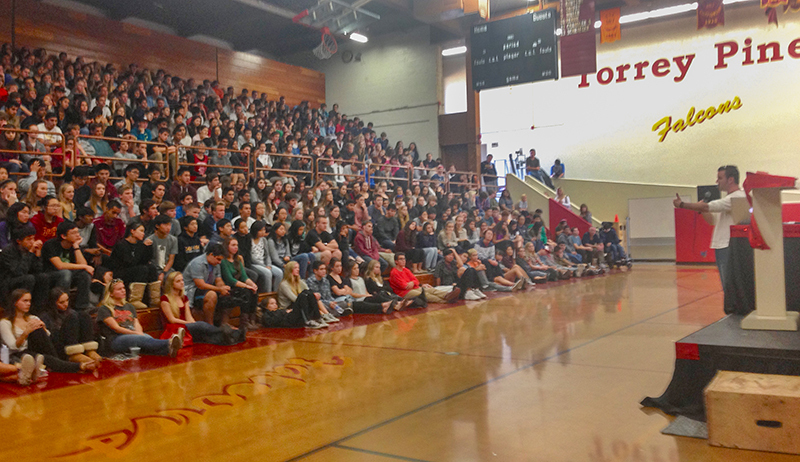 Voytek speaking to Torrey Pines high schoolers about cognitive neuroscience. Did you have any formative experiences at UC Berkeley you would like to share? I did really poorly on my qualifying exam. I passed, but just barely. That was an a-ha moment. I thought I understood what I was doing really well until people who weren’t in my domain exactly started really pushing at it. That made me realize there is a disconnect between the scientific language we use. Even amongst neuroscientists we don’t really understand each other very much. Each lab has its own niche, and its own tools and methods and ways of thinking about things. I realized that I was relying heavily on jargon, and that I didn’t have as solid of a grasp of what these things mean as I thought I did. That got me thinking about how to push at my own understanding more. After that I did a fair amount of public speaking and lecturing as a grad student. Learning how to explain things to people outside of my domain was a critical skill. What benefits have your science communication efforts had? There have been pros and cons. It is kind of stressful having a large online social media presence. There’s a little bit of “oh, what if I say the wrong thing.” But, largely it has been very positive in the sense that it has allowed me to interact with a lot of scientists and lay public from around the world that I normally wouldn’t be able to. And it’s gotten me to always keep thinking about how to explain these complicated neuroscience ideas in a way that other people can understand. It is grounding in that sense. We can do all these sophisticated and fancy techniques and analyses but there is a goal in the long run, which is trying to understand human cognition and disease. You also describe yourself as a zombie brain expert. What does that mean? When I was a PhD student at Berkeley, we used to do these movie nights occasionally, and we did a couple of zombie movies. If you get a bunch of neuroscientists drinking beers together watching zombie movies, suddenly you are having arguments like, ‘do zombies shuffle because of cerebellar or basal ganglia disruptions?’ My friend Tim Verstynen and I decided it would be kind of fun to write about the zombie brain. We wrote a few blog posts that ended up getting picked up by Wired, and then Princeton University Press asked us to turn our blog posts into a book. 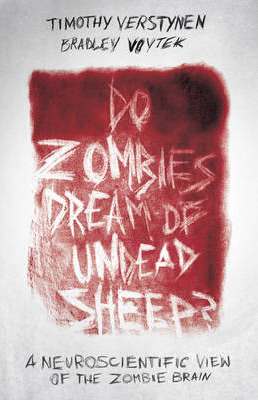 So we ended up publishing a book, “Do Zombies Dream of Undead Sheep,” which is basically an intro to cog neuro, but using the zombie hook. When did you first become interested in the oscillations of neural networks? There was a conference up in Whistler Canada, NIPS [the 2007 Neural Information Processing Systems Conference]. I was invited to give a workshop. Most of the speakers flew into Seattle and drove up in a van together. In that van there was a number of other neuroscientists who were really into neural oscillations. I remember that conversation during that snowy drive up and just really buying into it. By the end of the conference I went from thinking, ok, oscillations are kind of interesting, to oh my goodness there might actually be something really amazing here. Was it hard for you to decide what to do after your PhD? I got offered a job by a startup no one had ever heard of called Uber. 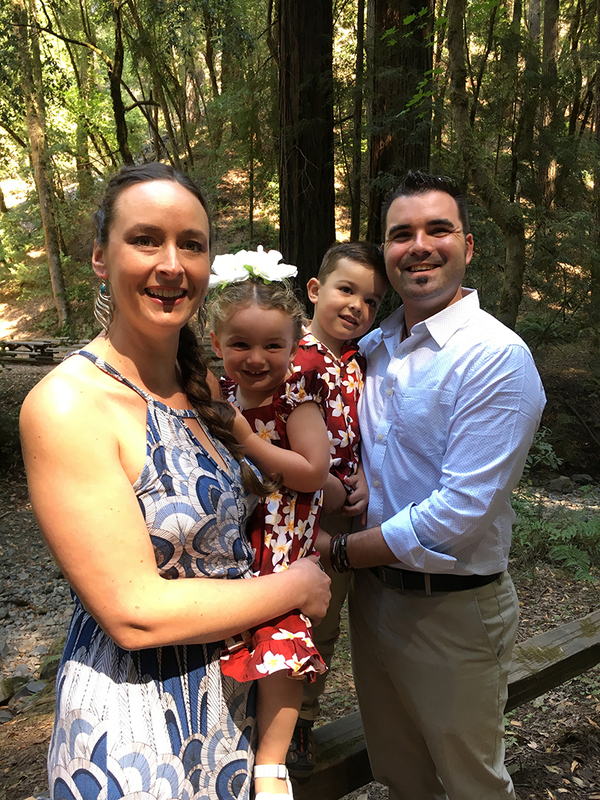 I accepted that because my wife was pregnant with our first kid at the time and they offered a salary that was very different from what a grad student or post doc would make, and I thought it would be a good way to save money. After the baby was born, I separated from Uber as I had planned to do and went back to the postdoc that was lined up after that. So even though I took a diversion in my career and I considered going the data science route, I considered briefly doing science writing, but my heart is really in research. Pushing myself in these different directions a little bit to see if I come back is something that I try and do. It helps me clarify that I really do want to keep doing research. 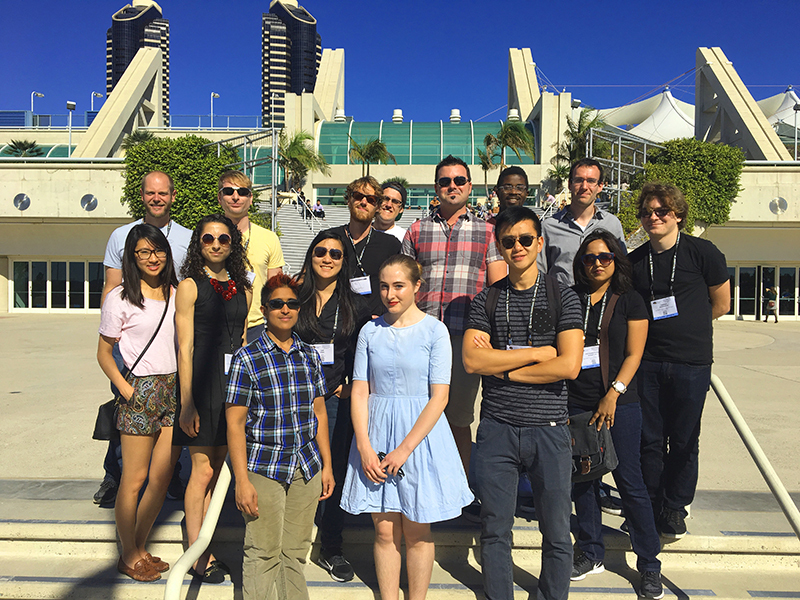 The Voytek lab at UCSD. What do you love about your current job running a lab at UCSD? It’s stressful, I’m not gonna lie. Running a lab is a lot of work. It is a big change. You have to learn to delegate and you can’t do everything on your own. That’s the hard stuff. The fun stuff is I remember the first time walking into my lab after I had been away at a conference or somewhere, and I walk into the grad student office, and my grad students and postdocs are all in there at the white board arguing about stuff and working something out. The science that I love, neural oscillations, the thing that I have been thinking about for years, now there is this whole other group of really smart talented people, in my absence, working through these problems. That was an amazing thing to see. There is progress being made. There is a collaborative spirit and that is super fun. It’s great. How will the research taking place in your lab at UCSD advance our knowledge of how the brain works, and why is that important? A lot of what we do in cognitive neuroscience is ask, ‘we know we have working memory and other cognitive abilities, where in the brain do those things happen?’ In my lab we try and say, that doesn’t really make sense. It is like asking where in your computer does video happen. It’s not a place, it’s a process. A lot of what we work on is how does the brain talk to itself? How do different brain regions coordinate information? What if that coordination goes awry? If there is hyper-synchrony between brain regions, maybe that could lead to something like epilepsy. If there is under-communication between brain regions, maybe that is what you see in a different disorder. We are trying to re-characterize a lot of psychiatric and neurological disorders not as pharmacological but as neuro-communication disorders. If you think of it that way, what are some ways you could intervene when the brain goes awry? We already do this but blindly, largely. The gold standard treatment for depression that is not treatable by drug or therapy is electroconvulsive therapy. That is still being used and it works and we don’t know why it works. For Parkinson’s Disease we use deep brain stimulation. You implant a permanent stimulating electrode into the brain and you turn it on and fiddle with it until the stimulation parameters cause the motor symptoms to go away. If we think about these as neuro-communication disorders then we can modify the circuitry by adding noise or oscillations, and maybe we can retune the circuit properly. We are going in the direction of electroceuticals. Instead of pharmaceuticals, you can have direct electroceutical intervention. Is that something your lab does or are you more focused on how it works in the first place? We are not building new devices, we are more focused on how it works. We work with patients undergoing deep brain stimulation or electroconvulsive therapy to try and see if our hypotheses about how these treatments should be influencing the networks are true. One of the things the lab has been pushing on is how to measure the relative balance of excitation and inhibition. We have got the two classes of neurons, excitatory and inhibitory. In human brain imaging they more or less just get mixed up into neural activity, and you can’t really separate them. Which is unfortunate because so many neurological and psychiatric disorders seem to be at least partly attributed to an imbalance in excitation and inhibition, and computational modeling work has shown excitation-inhibition balance is critical for maintaining memories and things like that. So if we had a way of measuring it that would be really powerful. In the lab we think we have a subtle but reliable way of indexing this relative balance in excitation and inhibition. The Voytek family. From left to right: Jessica, Linnea, Gavin, and Bradley. What research publication are you most proud of? There is a paper that my wife and I had written together that I was super proud of and I still love it to this day. It was this data mining paper about brainSCANr. It was making the argument that the peer reviewed scientific literature is vast. There is something like three million papers in PubMed related to neuroscience. How can any one person be expected to integrate 200 years of neuroscience research across three million papers? It was an attempt at synthesizing this vast amount of peer reviewed literature. There is a spot in my heart for that one. You mentioned that you have two children. How has having children changed your academic life? Tremendously. It really changes your time management perspective. Work-life balance is really important for me. If I start to notice when I am playing with my kids that I am distracted thinking about a paper or grant or deadline, that is a good metric that I am not putting my time where it should be. I don’t want to be distracted from my family. Quite honestly it probably slowed my career down by a number of years, because I took time off with my wife with both kids. I tried to take as full paternity leave as I could. We split responsibilities. We try to be as equal as we can be aside from the early basic biological stuff I can’t do. Having kids has changed my perspective on a lot of things. I can’t encapsulate it briefly. It is very much life changing in a good way. What advice do you have for current grad students? I actually wrote a lot of stuff on my lab website philosophy page, but I think the big one is, you are not your science, and criticisms you get about your work are not criticisms about you. It is really easy to internalize bad grant reviews and peer reviews, and I remember that feeling. Oh, they think I am stupid or a bad scientist. And that is absolutely not the case. The system is harsh, but it has its goal, which is to make the science better. It is totally unrelated to you as a person, so don’t internalize your failures. If you think about somebody like Udi Isacoff or Marla Feller or any of the faculty at Berkeley who are crazy successful, the only reason they are that successful is because they weathered through all of the crap of the grant rejections and peer review rejections over the years.